This crossover began way back in December of 2005, quickly capturing readers' interest with a teased double-page spread in which the Green Goliath literally tore poor Logan in two. The second issue arrived not long thereafter, and then… nothing. Remember when Image was the publisher most associated with constant delays and missed deadlines? Marvel has assured us that this lengthy hold-up was to ensure the completion of Damon Lindelof's scripts for the remainder of this series, but I won't believe it's fully back on schedule until I'm actually holding the penultimate sixth chapter in my hands. At this rate, that'll be some time in 2015. 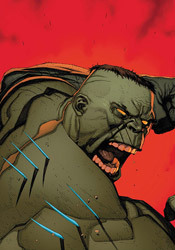 Picking up the pieces of the "Execution of the Hulk" story, told in Ultimates 2 #3, this series follows Bruce Banner in the months and years after that failed public execution. Upon learning of Bruce's whereabouts, Nick Fury sends his most ferocious contact to finish the job – a certain scrappy mutant with claws. And, unlike similar confrontations in the past, this Wolverine looks ready, willing and able to finish the job. No pulled punches this time around, no miracle last-second realizations that “hey, we're all on the same side here,” just two cornerstone characters with a grudge and a desolate wilderness in which to unleash their fury. This is the kind of predicament that made the Ultimate universe so appealing when it launched, the chance to see your favorite characters cast in a new light, freed from the chains of decades' worth of continuity and six ongoing monthly titles. Maybe things didn't exactly pan out that way for this line in the end, but Ultimate Wolverine vs. Hulk provides a great reminder of the optimism and anticipation that surrounded its launch. Lindelof's take on the title characters is very different, but they're still recognizable. An outsider to mainstream comics, he brings a new perspective to the men behind the costumes (or, in the Hulk's case, the mass of green muscle) and offers an original take on what they can actually do with their powers. As you'd expect, the majority of this fight is one-sided. The Hulk is the living embodiment of power and fury, while Wolverine's greatest strength is his ability to absorb punishment and keep coming back for more: you do the math. Outside of the specifics of just which wounds Logan will be licking afterwards, that part of the story pretty much writes itself, (and it's a lot of fun watching a human wrecking ball thrown down the side of a mountain) but that only eats up a fraction of the issue. The insights Lindelof provides into each character are the real emphasis this month: the reasons why the Hulk can suddenly read above a third grade level, Logan's motivations for taking the job; for my money those are just as fascinating as a tumble off the cliffside. On both fronts, Lindelof's script brings the goods. Chances are, if you're even vaguely familiar with the work of Leinil Francis Yu, you've already developed an opinion of your own about him. Myself, I see a lot to like about his grungy, sketchy, obsessively detailed artwork – he delivers the striking freeze frames of Travis Charest in half the time, decorates the stage with fantastic scenery and can dictate a ferocious battle scene. I can see why Yu's style is so polarizing with fans, but he's one of Marvel's big guns for a reason and he's brought his "A" game to Wolverine vs. Hulk. Look, I know what you're looking for here, because I was after it too. A reason to skip this issue, a confirmation that it wasn't worth the wait, that you should just stick with the two issues you've already bought and enjoy them for what they were, because the third chapter ruins everything you enjoyed about them. Sorry, but I can't do it. I'm not going to say it was worth waiting for, because nothing can really ease the pain of a three-year rain delay, but this is every bit as entertaining as verses one and two. It could still trip over its own feet when the next issue ships some time after the rapture, and the teaser at the end of this issue could go either way, but for the time being all remains well. Better than well, in fact. Buy it.